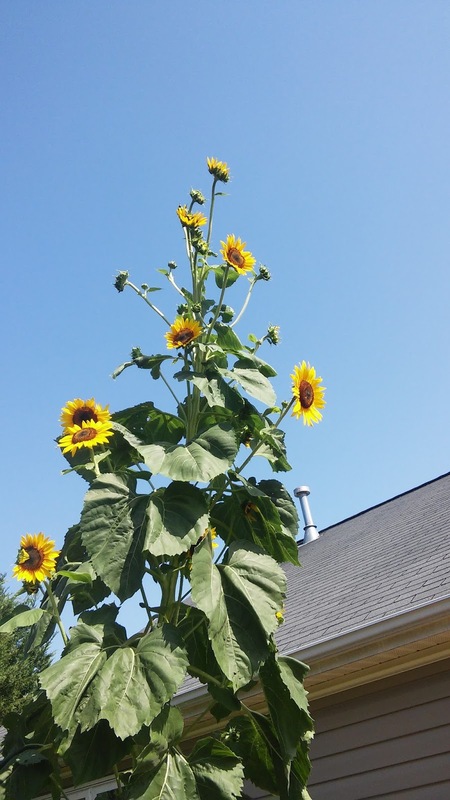 Jared Unzipped: An Update On That Freakish Mutant Sunflower In My Backyard. An Update On That Freakish Mutant Sunflower In My Backyard. 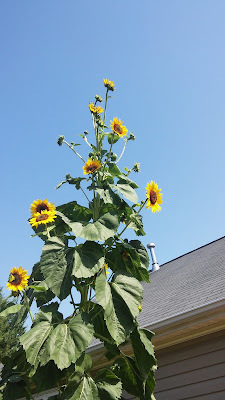 A few weeks ago, I mentioned a very tall, abnormal sunflower that was growing at my back patio. Since then, it has continued to grow and grow... and grow. This sunflower currently stands over twelve feet tall with dozens upon dozens of flowers on it. We had a bit of a scare a few nights ago when a massive thunderstorm struck. It caused the root ball to become loose due to an over-saturation of water. 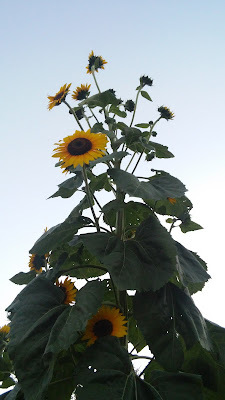 As such, the towering sunflower fell across our backyard and landed in our garden bed. Thankfully, we were able to use rope and stakes to pull the sunflower back upright. It's very top heavy due to its weight and stature. The sunflower plant is standing back up and its root ball has once again grown firm in the soil. All is well. The past few days have seen many numerous flowers opening on it. In fact, the larger flowers have more new flowers growing off of them! It's all quite remarkeable, to say the least. We're definitely going to save seeds from this plant and grow more leviathan-like sunflowers next season. For now, all we can do is marvel at just how miraculous this plant has proven to be. Never in my life have I seen a sunflower this large in person. Have you? If so, please share your story below.